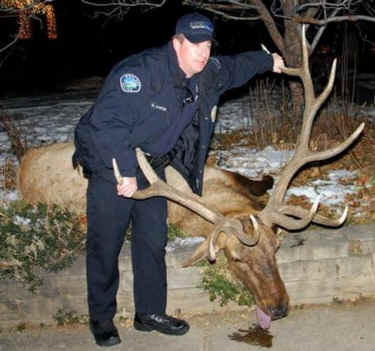 Our fight for justice for Big Boy, an elk who lived peacefully in Boulder, Colorado before he was heartlessly gunned down by a police officer, is paying off. Due in part to more than 27,000 petition signatures and emails from IDA supporters, felony and misdemeanor charges have been filed against the officer who shot Big Boy and another who allegedly helped plot the killing! We are thrilled to inform you that your letters worked! On January 18, the District Attorney announced that Officers Sam Carter and Brent Curnow were arrested and charged with multiple felonies and misdemeanors. Then, following the release of texts between the two officers like "Oh, he's dead tonight," "he's gonna die," and "when you think you can whack it," both officers resigned in disgrace from the Boulder Police Department on January 22.